Riot Act, Inc. presents our Annual Series of Short Plays June 20-23 at 7:30pm nightly in Dancers’ Workshop Studio 1 in the Center for the Arts. Need some small bites of comedy and drama? 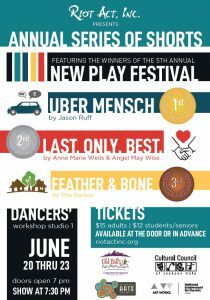 Always a spring favorite, Shorts features new regionally written plays. Join us. 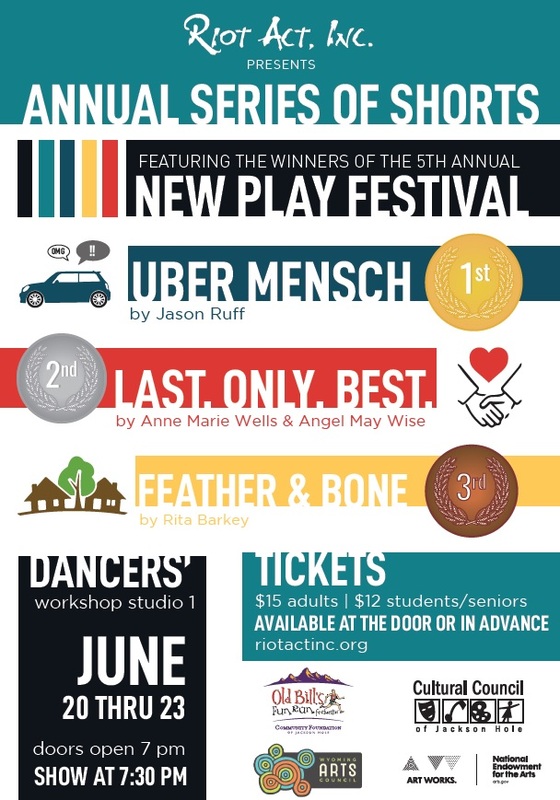 Riot Act, Inc. is thrilled to present the winners of its 5th Annual New Play Festival. Seven original works were submitted for the contest and judges ultimately selected three short plays to be produced as part of Riot Act’s Annual Series of Shorts. The first-place winner will receive $100 and the Marius P. Hanford IV Award. Marius was a longtime stage combat choreographer influential in several theater communities, including Jackson and New York. The second and third finalists will be awarded $50 each. A night in the life of an Uber driver and his interactions with the people he gives rides to. Starring – Karissa Dabel, Lacey Lukas, Jack Sieber, Danny Suarez, Deborah Supowit, and Michael Yin. A grandmother imparts to her granddaughter the tough parts that made her relationship to the grandfather stronger. A land and conservation feud in a small community goes terribly wrong. Tickets are available in advance at online at www.riotactinc.org or at the door. Tickets are $15 for adults, $12 for students/seniors. Brand new, re-designed Riot Act, Inc. T-shirts and Stickers plus Concessions will be available before each performance and during intermission. Short plays allow the audience to taste several small bites of theatre in one evening. Mature content, parental guidance is suggested. Please join us on the stage! For more information, contact riotactinc@earthlink.net. *Project made possible by grants from Wyoming Arts Council/NEA, Cultural Council of JH, JH Community Foundation, and Your Old Bill’s donations.